George Kramer, V86, had wanted to be a veterinarian from about the time he was four years old. He recently joked that he was likely brainwashed by his father, who had wanted to care for animals but ended up going into insurance, real estate, and construction. Yet when Kramer was in high school on Long Island in the 1970s, would-be veterinarians faced a steep climb: Fewer than two-dozen schools existed in the U.S., and they tended to accept only a small percentage of applicants from their states. Kramer’s guidance counselor told him he’d never get in. From the start, Kramer felt grateful he didn’t end up elsewhere. “I thought a lot about how much happier I was at Tufts,” he said. “Tufts was so new that they involved students in establishing its whole structure and curriculum.” (Case in point: One of Kramer’s longtime mentors was Franklin Loew, the school’s second dean.) Initially interested in equine surgery, he fell in love with cardiology and internal medicine after a one-on-one selective with James N. Ross, now Distinguished Professor Emeritus. “That was it—from there, that was what I planned on doing,” Kramer said. During his time at Tufts, Kramer relied on student loans as well as support from his parents, George and Vivian. “My folks helped me out a lot, and I always wanted to eventually make them a gift of the money they had invested in me over the years,” he said. Although he couldn’t do that before they passed away, Kramer has now made a gift to Cummings School to create a new scholarship honoring their memory and helping veterinary students in financial need. Kramer’s family helped ensure his successful future in another way, too. 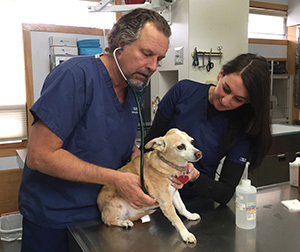 After graduation, he leveraged the business expertise inherited from his father and grandfather to found Atlantic Coast Veterinary Specialists in Bohemia, New York, where he now directs a cardiology residency program. He also founded Ultravet Mobile to provide traveling ultrasound services for animals at more than 300 veterinary clinics in the New York metropolitan area, as well as at the Bronx Zoo and Coney Island Aquarium. 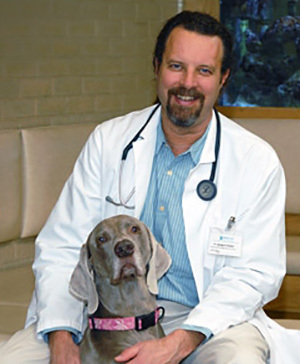 Kramer finds the work in his specialty practice rewarding—especially the opportunities to develop long relationships with pets and owners fiercely committed to saving them—but also emotionally challenging. “You can extend pets’ lives, but you cannot make their hearts normal again,” he said. Frustrated by a lack of good medical solutions, Kramer in 2011 launched Ultravet Medical Devices to design better options, and he since has developed several patented devices. One is a bronchial stent placed via catheter to relieve coughing in dogs with degenerative mitral valve disease. Another device called the CoApt valve—now nearing the end of preclinical studies—is delivered via catheter to repair leaky heart valves in dogs with valvular disease so severe they would otherwise require expensive and difficult-to-access open-heart surgery. Last year, Kramer made the difficult decision to sell his specialty practice to PetVet Care Centers, which made him a partner. The sale gave him more time to devote to his medical-device research and his family, Kramer said, but also the means to “thank my parents for everything they did for me and to thank Tufts for what it did for me.” The George and Vivian Kramer Scholarship—the fifth endowed scholarship fund established by a veterinary school alum in the history of Tufts University—will make its first award this fall.